We whip out an old standard: Five for Five, which takes us from life with two suns to Starbucks' fun-packed new iced drink size, Trenta (a whopping 16 ml bigger than the average capacity of the adult human stomach! Although nowhere near maximum capacity as this handy illustration shows). Somewhere in there we manage to make (too much) time for bestselling author Snookie and her homies on The Jersey Shore. Is there hope for mankind? Ask again in 2012. If we're slathering on the sunblock at 10:30 PM, then the answer is no. 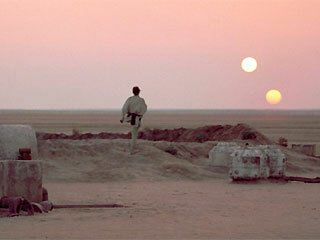 - Will the Earth have two suns by 2012? - True Grit (which Bill needs you to see on pain of death). - Snookie joins ranks of Hemingway and Salinger (and she loves us all!) and parties. - Wikileaks’ journalistic partners in crime. - Trouble sleeping? Cue up Insomnia, One Hour Photo or The Fisher King.